WASHINGTON — The House on Thursday gave a significant boost to President Donald Trump's promise to cut taxes, narrowly passing a GOP budget that shelves longstanding concerns over federal deficits in favor of a rewrite of the tax code that Republicans promise will jump-start the economy. The 216-212 vote permits Republicans to begin work on a follow-up $1.5 trillion tax cut and move it through Congress without fear of blocking tactics by Democrats. 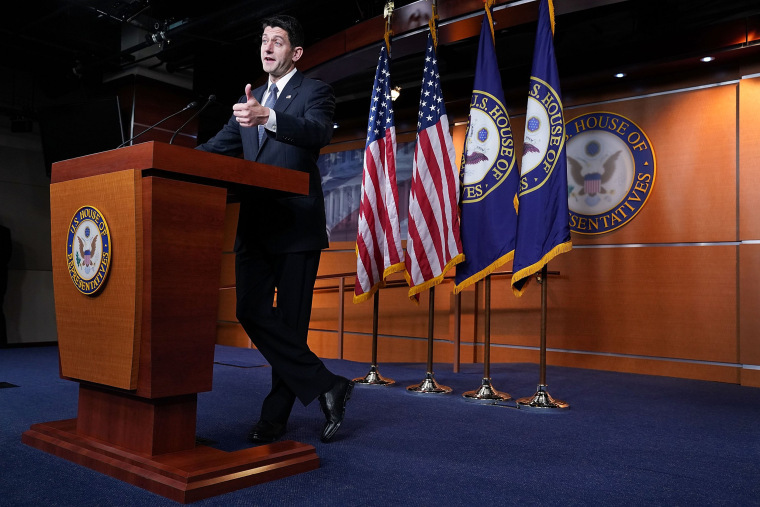 The tax bill is the top item on the GOP agenda, would be Trump's first major win in Congress — and, Republicans hope, a much-needed boost for the party's political fortunes on the eve of next year's midterm elections. "Big news — Budget just passed," tweeted Trump. Republicans view passage of the upcoming tax measure as a career-defining dream, and its importance has only grown in the wake of the party's debacle on health care. But the tax plan's popularity is not a given with voters, and fissures among Republicans already threaten to slow the measure. "This isn't over," said Rep. Tom MacArthur, R-N.J. The underlying budget measure abandons the Republican Party's longstanding promise to rein in deficits in favor of Trump's boast of "massive tax cuts." The measure drops proposed cuts to mandatory programs such as food stamps, though conservatives promise to take on spending cuts later. Ways and Means Committee Chairman Kevin Brady, R-Texas, says he'll schedule a panel debate and vote once the budget plan is safely passed, and much of the buzz in the Capitol concerned a flurry of horse trading as Republicans struggled to find ways to raise revenues to help finance cuts to individual and corporate tax rates. The goal is a full rewrite of the inefficient, loophole-laden tax code in hopes of lower rates for corporations and other businesses and a spurt of economic growth. Brady, for instance, told reporters on Wednesday morning that he's still looking at curtailing tax-free deposits in 401(k) retirement accounts, a move that could raise revenue in the near term as retirement savings shift to Roth-style accounts that are funded with after-tax earnings. "To do tax reform, you need money. And right now, even as we speak, they appear to be going wobbly on some of the issues they've raised with great certainty in previous weeks," said top Ways and Means panel Democrat Richard Neal of Massachusetts. "They've got a revenue problem, a real revenue problem. And you have to make some dramatic changes to benefits that people across America have come to expect and enjoy." An Associated Press-NORC poll released Wednesday found most Americans saying Trump's tax plan would benefit the wealthy and corporations, and less than half believing his message that "massive tax cuts" would help middle-class workers.